Boxed battery operated toy robot. The robot is battery operated, the battery pack it on its back. The robot is a classic Robby the Robot shape. The robot's body is black with red feet and bands on the arms. The arms are forward facing with rubber hands at the end. In the centre is a silver square with a red switch. His head is mainly within a clear Perspex dome and there are antennas on either side of his head, one facing upwards the other sideways. The box had a plain card bottom and a printed top. The main box colour is blue and has a picture of a red Robby walking in a lunar landscape. This object was acquired for the V&A Museum of Childhood's exhibition Space Age: Exploration, Design and Popular Culture, which opened on 22nd November 2007. 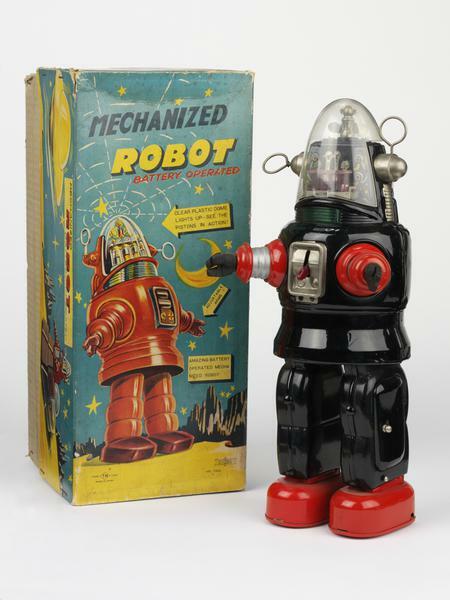 It was bought at Christie's in November 2005 as part of a collection of robots and space toys. The collector, Paul Lips, ran an antique toy shop in Milan from the early 1990s, where he became particularly interested in space toys. The collection covered what he believed to be their golden age: 1955 to 1965. After the Second World War, Japan became the pre-eminent manufacturer of tin toys through direct financial support from the United States for its toy industry, and through preferential access to US toy markets. Importantly, Japanese manufacturers were able to perfect small battery-powered motors, which gave Japanese toys a superior range of movements. 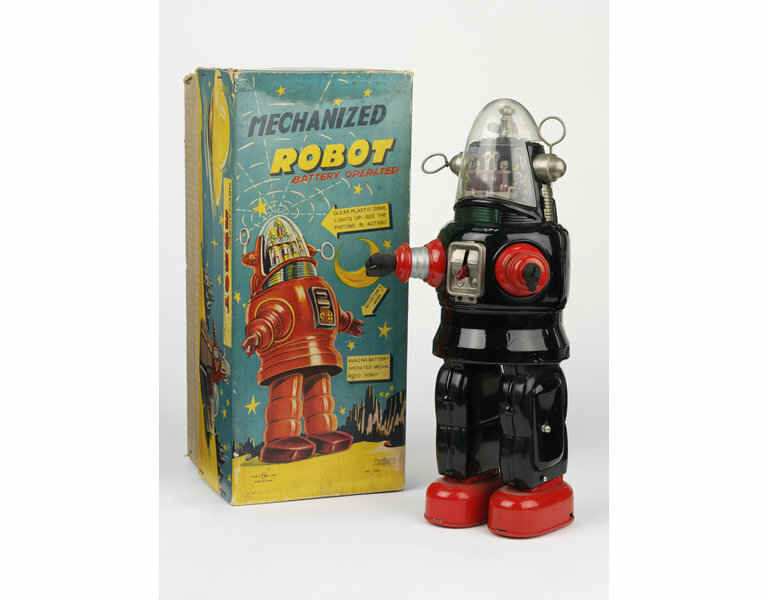 One of the most celebrated subjects expressed in tin toys is space and space travel. Many highly imaginative toys were produced in the era of the Space Age (1957-1972), inspired by the widespread optimism of the times, and by a fresh public appetite for all things space. 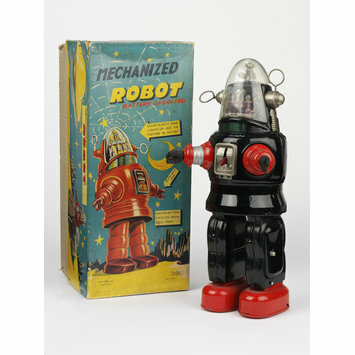 Boxed battery operated tin toy, 'Robby the Robot', made in Japan by Nomura about 1957-1959.